A complete version of this PIC is available as a pdf document. Advances in horizontal drilling and hydraulic fracturing techniques have increased oil and gas exploration and production in Kansas. The new methods require larger volumes of water and, consequently, increase the amount of oil and gas wastewater to be disposed of in comparison with conventional methods. The volume of fluid and chemical additives associated with hydraulically fractured horizontal wells has heightened concerns about the potential impact on groundwater quality. This circular provides information and outlines procedures for landowners interested in assessing groundwater quality in the vicinity of hydraulically fractured wells through sample collection and analysis. Baseline water-quality sampling, before and after drilling, is not mandated by state or federal law. However, baseline sampling is recommended by the American Petroleum Institute (API, 2009) to establish the pre-existing quality of the groundwater. Without such analysis, it is difficult to pinpoint the cause and timing of water-supply degradation, if it should occur. Baseline water-quality sampling is prescribed in areas of oil and gas production in addition to, not in place of, recommended regular water-quality testing of private domestic drinking water wells. This public information circular includes information about hydraulic fracturing techniques and fluids, depth to water in Kansas aquifers, water-quality standards, accredited water-sampling laboratories, and testing guidelines that can be used to make decisions about water sampling and analysis. This document is not an interpretation of law or a general policy statement by the Kansas Corporation Commission (KCC), Kansas Department of Health and Environment (KDHE), or Kansas Geological Survey (KGS). Terms in bold face type are defined in the glossary at the end of the circular. Informally called "fracking," hydraulic fracturing dates back to 1947 when the practice was pioneered for vertical wells in the Hugoton gas field in Grant County, Kansas. In recent years, operators have begun drilling horizontal wells--drilling vertically then turning horizontally through a known oil or gas zone (fig. 1)--then employing hydraulic fracturing. Since 1947, tens of thousands of wells have been hydraulically fractured in Kansas, and no contamination incidents associated with hydraulic fracturing have been reported to the KCC. The KCC is the state agency that oversees and permits oil and gas drilling, hydraulic fracturing, and the plugging of oil and gas wells. Figure 1--Hydraulic fracturing water cycle from acquisition to treatment and disposal (modified from EPA, 2012). With hydraulic fracturing, fluid is injected into a well under high pressure (up to thousands of pounds per square inch) to fracture rock formations and release oil and gas (fig. 1). The method is nearly ubiquitously used in rocks known to contain oil or gas trapped in unconnected pores and not economically producible without hydraulic fracturing. After a well to be fractured has been drilled and constructed using multi-levels of steel casing and high-quality cement, the well casing is perforated in the target zone, allowing the hydraulic fluid to fracture the rock. Typically, fractures created during the process are the width of a single grain of sand (approximately 1 mm, or 0.04 in) and vary in length up to hundreds of feet (Suchy and Newell, 2011). After the rock is fractured, oil and/or gas released from isolated pores and fractures in the rock can flow freely via steel casing or tubing to surface containment vessels or pipelines. Hydraulic fracturing fluids typically consist of 90% water, 9.5% proppant (sand or other inert material), and 0.5% additives (Suchy and Newell, 2011). The water carries the sand and additives and delivers the high-pressure energy necessary to fracture the formation. The sand props the fractures open while the various additives reduce friction, thicken the fluid to carry the sand, eliminate bacteria, and reduce pipe corrosion (API, 2009). Once fracturing is completed and injection of the fluid is discontinued, the fluid is pumped to the surface through the wellbore. The fluid, known as "flowback" and "produced water," contains both fracturing fluids and naturally occurring fluids (formation brines and hydrocarbons) in the rock. Generally, 30-70% of the fracturing fluids are recovered. In Kansas, flowback and produced water are typically stored on site in lined pits or tanks before they are injected into deep underground disposal wells (fig. 1). The remaining fluids are trapped in pore spaces after fractures collapse, generally thousands of feet below freshwater aquifers (GWPC, 2009). Freshwater is found in many formations and at various depths throughout Kansas (table 1 and fig. 2). Hundreds, even thousands, of feet of rock with very low permeability layers separate the freshwater from the zones targeted for high-volume hydraulic fracturing operations, which are approximately 1,200 to 5,000 feet (366 to 1,524 m) deep in the state. Producing oil and gas fields in Kansas are depicted in fig. 3. Table 1--General depth to groundwater and bottom of aquifers in Kansas. a Depths are approximate and generalized over the extent of the entire aquifer. Figure 2--General locations of major and minor freshwater aquifers in Kansas. 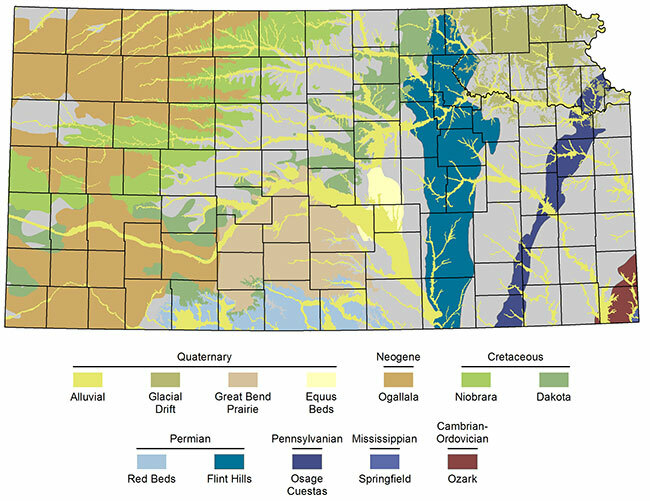 The aquifer names (e.g., Ogallala) are organized by their geologic age (e.g., Neogene). 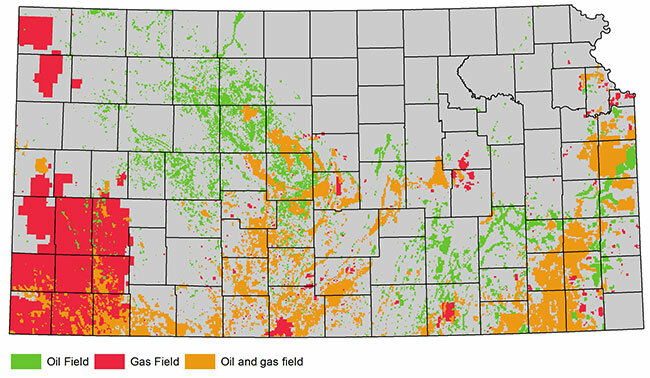 Figure 3--Kansas oil and gas fields. In general, a baseline assessment includes sampling and analysis of water wells located in proximity to a new drill site. Irrigation, lawn and garden, and domestic are among the wells that can be used for sampling (fig. 1). Petroleum companies sometimes install a dedicated monitoring well at new drill sites but are not required to do so in Kansas. Collecting a groundwater sample for chemical analysis is a specialized skill requiring specific training to ensure data quality and reliability. Analytical results from the most meticulous laboratory may not be meaningful if the techniques used to collect the sample introduce substantial error. It is highly recommended that a third-party professional collect groundwater samples. Some laboratories employ trained technicians, while others may contract with a company that understands sampling and laboratory protocols. It is important to select a laboratory accredited by the KDHE. Those laboratories are subject to routine quality assurance evaluations by KDHE. All accredited Kansas laboratories are listed in table 2. Accredited laboratories comply with regulations set under the Safe Drinking Water Act. The drinking-water accreditation status should be verified with KDHE before selecting the laboratory. Using an accredited laboratory with the capability to analyze all the different parameters (listed in table 3 and discussed in the next section) helps ensure data of known quality and legal defensibility. Some laboratory analysis must begin within 24 hours of sample collection, so select a laboratory within driving or overnight shipping distance of the well site. A full listing of all drinking-water accredited laboratories can be searched through the KDHE Environmental Laboratory Improvement Office (ELIPO) online data base at http://public1.kdhe.state.ks.us/LabAccredit/LabAccredit.nsf/SearchLabInternet2?OpenForm. Table 2--All Safe Drinking Water Act accredited laboratories in Kansas (as of January 2, 2013). Accreditation should be verified with KDHE before selecting any laboratory. The most current list of accredited laboratories can be searched at http://public1.kdhe.state.ks.us/LabAccredit/LabAccredit.nsf/SearchLabInternet2?OpenForm. Table 3--Baseline water-quality sampling tiers. The Environmental Protection Agency (EPA) and the state of Kansas regulate public drinking water supplies. They do not regulate private drinking water wells. The EPA has set standards, which the state of Kansas has adopted, for the maximum contaminant level (MCL) of certain substances for public drinking water supplies. These primary standards protect public health by limiting the parameter level or concentration in public drinking water. The EPA also has set National Secondary Drinking Water Standards (NSDWS), which are non-enforceable guidelines for substances that may cause aesthetic or cosmetic effects (for example, undesirable taste) at high levels. Additionally, drinking water equivalent levels (DWEL) are estimated lifetime exposure limits for substances that have carcinogenic potential but have not yet been proven as a known carcinogen. Testing parameters for water quality include chemical and physical qualities--such as pH, alkalinity, sodium, and chloride--that can be measured in water samples. Parameters were selected based upon their general use in oil and gas development in Kansas. In table 3, water-quality parameters have been divided into three tiers based on sampling costs. The most basic parameters are in tier one. Progressively, more parameters are added in tiers two and three. When cost is an issue, start with the parameters in tier one. If analysis of any parameter in tier one exceeds its MCL, NSDWS, or DWEL threshold shown in table 4, testing of additional parameters in tier two or tier three should follow. For example, if chloride exceeds the recommended 250 mg/L, then testing of other parameters from tier two is recommended. The MCL, NSDWS, and DWEL groundwater standards (table 4) for the three tiers can be used as a tool for evaluating the results of water-quality tests. If a parameter exceeds the set standard, contact the KCC or KDHE (contact information is included at the end of the circular). Table 4--Primary and secondary testing parameter thresholds (EPA, 2009; Bradshaw and Powell, 2004). Due to the variable rate at which water travels through an aquifer, there is no set recommended time frame in which to retest a water supply or monitoring well. However, landowners who obtain drinking water from a private well should regularly monitor for any changes, such as in color, odor, or taste (Swistock, 2010). Changes in one or more of these aesthetic properties should be noted, as a change might signal additional testing is needed. However, not all contaminants are noticeable. Therefore, private well owners are highly advised to routinely sample and analyze their water supply. The level of sampling could begin at a basic level to determine which parameters have changed and expand to more extensive tests as needed. The baseline water-quality analysis discussed above is suggested in addition to the recommended domestic water-quality testing for private wells. The volume of fluid and associated chemicals used during hydraulic fracturing associated with horizontally completed wells has heightened concerns about potential effects on groundwater quality. Baseline sampling, although not mandated by law, is prudent to establish the pre-existing quality of the groundwater. Without such analysis, it is difficult to pinpoint the cause of water-supply degradation, if any should occur. The sample procedures, suggested laboratories, and three tiers of analytical parameters outlined here are intended to assist well owners in obtaining water-quality samples and analysis. This document is not an interpretation of law or a general policy statement by the KCC, KDHE, or KGS. For more information about oil and gas production, please visit the websites of the KCC (www.kcc.ks.gov), KDHE (www.kdheks.gov), and KGS (www.kgs.ku.edu). API, 2009, Hydraulic fracturing operations--well construction and integrity guidelines: API Publishing Services, American Petroleum Institute, Washington, D.C., http://www.shalegas.energy.gov/resources/HF1.pdf. Bradshaw, M. H., and Powell, G. M., 2004, Understanding your water test report: Agricultural Experiment Station and Cooperative Extension Service, Kansas State University, Manhattan, Kansas, http://www.ksre.ksu.edu/bookstore/pubs/MF912.pdf. EPA, 2009, Drinking water contaminants: U.S. Environmental Protection Agency, Washington, D.C., http://water.epa.gov/drink/contaminants/index.cfm. EPA, 2012, The hydraulic fracturing water cycle: U.S Environmental Protection Agency, Washington, D.C., http://www.epa.gov/hfstudy/hfwatercycle.html. GWPC, 2009, State oil and natural gas regulations designed to protect water resources: Groundwater Protection Council, Oklahoma City, Oklahoma, http://www.gwpc.org/sites/default/files/state_oil_and_gas_regulations_designed_to_protect_water_resources_0.pdf. Suchy, D. R., and Newell, K. D., 2011, Hydraulic fracturing of oil and gas wells in Kansas: Kansas Geological Survey, Lawrence, Kansas, http://www.kgs.ku.edu/Publications/PIC/pic32.html. Swistock, B., 2010, Gas well drilling and your private water supply: College of Agricultural Sciences & Cooperative Extension, Pennsylvania State University, University Park, Pennsylvania, http://extension.psu.edu/water/marcellus-shale/drinking-water/gas-well-drilling-and-your-private-water-supply-2. Aquifer: a geologic formation, or body of rock, that is porous and permeable enough to transmit groundwater at a rate sufficient to yield significant quantities of water to wells or springs. Baseline: a standard by which things are measured or compared. Brines: water with high dissolved salt concentration. Drinking water equivalent level (DWEL): an estimated, non-enforceable exposure level for chemicals that may be carcinogenic but for which carcinogenicity has not been completely established. Flowback: hydraulic fracturing fluids recovered either under natural pressure or by pumping action. Maximum contaminant level (MCL): threshold set by the EPA on the amount of a substance that is allowed in public water supplies. National Secondary Drinking Water Standards (NSDWS): non-enforceable guidelines that regulate substances that may cause aesthetic effects (such as odor) in water. Pore: a space in rock, soil, or unconsolidated sediment that is not occupied by mineral matter and that allows the passage or absortion of fluids. Produced water: water produced during drilling for and extraction of oil and/or gas from the subsurface. Safe Drinking Water Act: the principal federal law in the United States, intended to ensure safe drinking water for the public, that authorizes the EPA to set health-based standards for naturally occurring and man-made contaminants. Well casing: heavy metal pipe, lowered into a borehole during or after drilling and cemented into place. It prevents the sides of the hole from caving, prevents loss of drilling mud or other fluids into porous formations, and prevents unwanted fluids from entering the hole (Suchy and Newell, 2011). Wellbore: a drilled hole with sealed well casings to isolate fluids and gases from coming into contact with the geologic layers through which the hole was drilled. This publication was written in cooperation with staff members of the Kansas Corporation Commission (KCC) and the Kansas Department of Health and Environment (KDHE). It also benefited greatly from the reviews and comments of Rex Buchanan, Cathy Evans, Don Whittemore, Susan Stover, and Wayne Bossert. The publication was edited by Julie Tollefson with figures modified by Mark Schoneweis.